Members of the section are psychiatrists working in different fields of mental health at Universities, Hospitals and other Health Care System Units. However, the target section is to include emergency medicine physicians and other professionals involved in mental health prevention interested in the complex differences in approaches to emergency psychiatry linked to social evolutions, immigration, women and children violence, welfare crisis due to economic reasons. The aim of the Section is to address the developing challenges to emergency psychiatrists in this second decade of the 21st century, indicating growing areas such as natural and human induced disasters, victims of genocide, human violence and terrorist attacks,. A considerable range of topics can be treated, including substance abuse, commitment, aggression, PTSD, EMDR, suicide, catastrophes. A particular attention must be dedicated to different European legislation about the use of restraint systems and civil commitments. The Section seeks to better define emergencies and urgencies in Psychiatry and to differentiate which kind of violence has to be considered as induced by psychopathological conditions or a derivate of “human being”. The in progress Italian experience (i.e. the University Department of Mental Health in Turin) includes services of drug and alcohol addiction, adolescence, psychology, psychiatric emergencies and PTDS treatments. Interaction with mental health and drug services may be a topic to be discussed and compared at European level. Thus, because some items of Emergency Psychiatry could be considered as cross cultural, certainly strong collaboration with other Sections may be considered. Deinstitutionalisation, treatment of acute psychiatric disorders, commitments, reclusion and restraint. International Book Fair of the City of Turin. Peer Education Course. European School. Ten lessons for training on peer education on Drug Addiction and Psychiatric Emergencies. An ad hoc educational programme for mid school students for training in peer education. • The section has organised a symposium at the National Italian Congress of the Italian Psychiatric Society (held every three years). 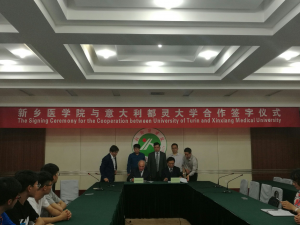 Conferences on the psychiatric experience have been held in the Chinese Universities of Heinan, Boao, Hubei Xinxiang in October, December 2018 and January 2019. A research on Civil Commitments in the Turin five G.H with psychiatric ward, after twenty years observation has been published in the Journal of American Emergency Psychiatry (Feb 2019, 2 Issue). The book on the closure of Mental Hospital in Italy (PM Furlan, Donzelli ed. Roma 2016, p. 450, has been discussed in several presentations. An International agreement with the Brazilian States of Piaui, Rio Grande do Sul and Nova Iguaçu has been renewed (since 2003) and, in collaboration with the Department Clinical and Biological Sciences of Turin University, (Scientific responsible prof. Pier Maria Furlan). Two members of the Section have hold several courses in 2018 by teleconferences (Furlan, Oliva). A special seminar will be held in Brazil next spring on Psychiatry and Community Interventions in Terensinhas, Nova Iguaçu, San Paolo and Sao Lorenço do Sud May 2019). Of particular importance how to use mental hospitals and to manage mental care in the community. The section in collaboration with the School in Hospital national network will work with regional hospitals in the above States to transmit and share the practicalities of the educational experience with hospitalised children. A major activity has been run by the Dutch representatives (report not arrived in time). Professor Mulder (vice Chair) has published a considerable number of international papers (pub med). Professor Sam Tiano and the Dutch Psychiatric Association is organising an on going International meeting involving the World Psychiatric Association and the Emergency EPA and WPA Sections in a co-sponsored conference on “Crisis, Coercion and Intensive Treatment in Psychiatry” which might be held in 2020.